Being located just a 30 minute drive to Coventry we are often booked for our dance floor hire for events in Coventry and surrounding areas. 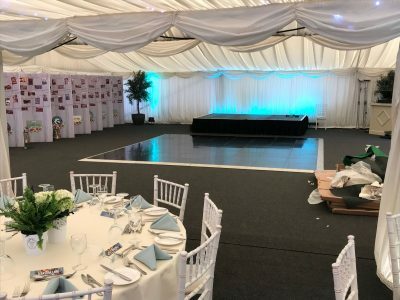 We were contacted by Danielle at Blue Diamond Ltd (who are chain of garden centres) to supply a dance floor for their annual awards evening at Coombe Abbey in Coventry. 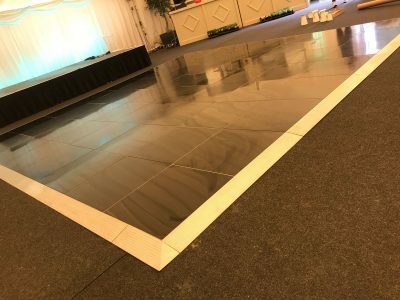 Originally the client was unsure of what design and size of dance floor they were looking for; luckily we were on hand to send over a range of different ideas for them to browse through. 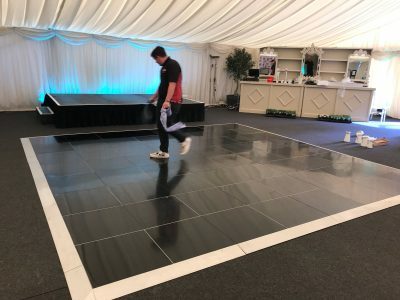 With a large of stock of white starlit, black starlit, plain black,, plain white, parquet and black & white chequered dance floors they had plenty to choose from. Our client opted for our 16ft x 16ft plain black dance floor which on average takes our events team around 30 to 40 minutes to install. On the day event we were mesmerised at what a stunning venue Coombe Abbey is, it is definitely one of the most beautiful venues our team have had the pleasure at visiting. The installation of the dance floor was a very straight forward process and really added a touch of beauty to the room. 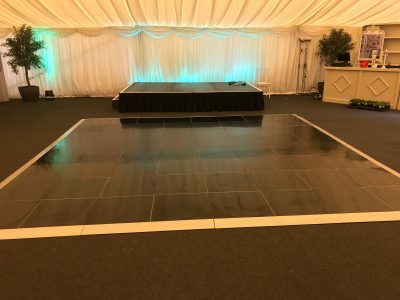 The following morning when we returned to Coombe Abbey to collect the plain black dance floor we received some great feedback, and it certainly added to the success of the overall event! Over the last 12 months we have yet again invested in our dance floor stock. We have increased our stock levels of the following dance floors; white starlit, parquet and plain black. Our events team are very experienced at laying dance floors, laying our full range for a wide variety of events throughout the year. After every event each panel and piece of edging is clean thoroughly by our warehouse staff to ensure we can maintain our high standards. 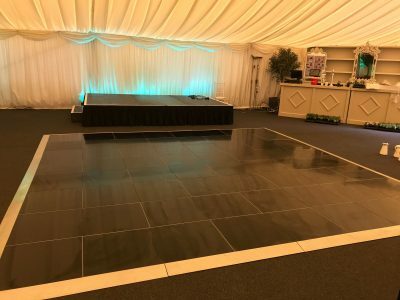 If you are interested in our plain black dance floor hire or would like more information for hire throughout in Coventry, or surrounding areas such as Warwick, Rugby, Royal Leamington Spa, Bedford and Nuneaton please don’t hesitate to get in touch. You can give us a call on 0116 2885956 or alternatively you can email us on info@solidstateuk.co.uk. About to start an event like Dance floor Hire In Coventry, Coombe Abbey?